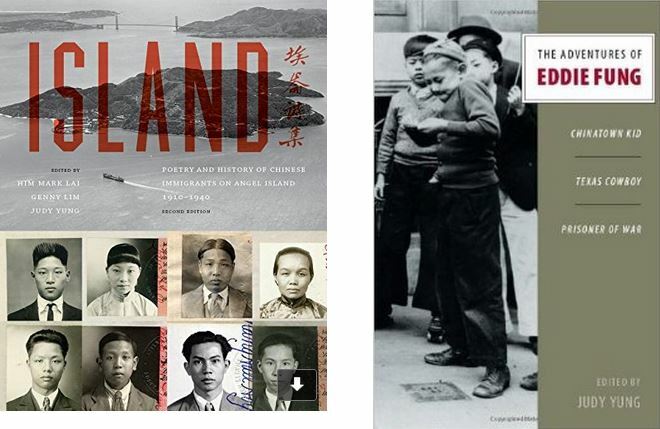 Judy Yung & Eddie Fung, Tuesday, May 5, at 7 p.m.
Judy Yung, Professor Emerita of American Studies at the University of California, will discuss her book, Island: Poetry and History of Chinese Immigrants on Angel Island which includes a new historical introduction, poems from Ellis Island and Victoria, B.C., twenty oral histories, and dozens of new photographs. In his memoir, The Adventures of Eddie Fung, Eddie recalls how his Chinese upbringing and work as a Texas cowboy helped him to survive forty-two months of captivity as a POW of the Japanese during World War II. Tuesday, May 5, at 7 p.m.